NEW YORK (CelebrityAccess MediaWire) – Synth-pop punkers Cobra Starship will be hitting the road for a four month tour, commencing on January 28th. 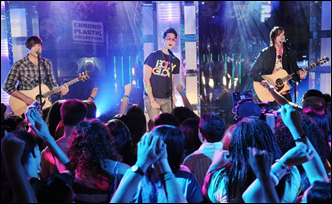 The band's lead singer Gabe Saporta has the band working on a new and third album slated for release in 2009. During their solo tour the New York based band will be joined Fall Out Boy, All Time Low, Metro Station and Hey Monday for "The Believers Never Die Part Deux" tour. The dates for this leg are marked with an asterisk.